Fun for little and big kids. Plaque is a nasty layer of bacteria and germs that builds up on our teeth every single day. If we let plaque stay on our teeth for too long it can start to do bad things to the enamel that protects our teeth. Our teeth to decay and rot. Our teeth to need fillings at the dentist. Our gums to develop gum disease. To stop plaque from harming our teeth we need to brush our teeth twice a day for 2 minutes and floss regularly. Play the memory game to defeat the plaque monsters. Elmo’s Brushy Brush song. Have some fun and sing along with Elmo and his friends. Explore Mouthie’s laboratory and find out all about your teeth and mouth. Encouraging good oral health at an early age can be one of the best gifts you can give your child. Tooth decay can occur at the earliest of ages and failing to teach children the importance of cleaning teeth thoroughly can result in painful, expensive and potentially health damaging oral conditions. Since tooth brushing only manages to clean 60% of the teeth surface area it is important to have some method to clean the areas between the teeth that toothbrush bristles can’t reach. Flossing with dental string is very difficult for children to perform effectively and it can feel almost impossible to persuade them to do it regularly. 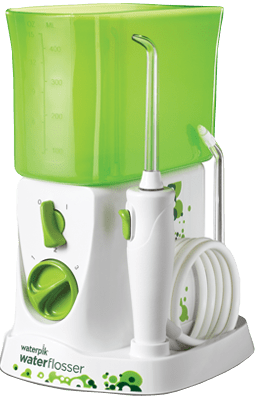 An excellent alternative is the Waterpik for kids water flosser. Waterpik are the top manufacturer of water flossers who have decades of experience developing personal power flossers. The Waterpik for Kids WP-260 is especially designed for children. It features a fun, funky green design with extra safe constuction. Dental health can have far-reaching effects on general health and happiness. A healthy, happy smile has a proven positive effect on your physical, social and professional wellbeing. Mouthpower.org promotes good oral health habits and practices that will help you keep your teeth and gums disease free though out your lifetime. Mouthpower.org provides free motivational tools. games, product reviews and information to help children and adults achieve to best level of oral health possible.